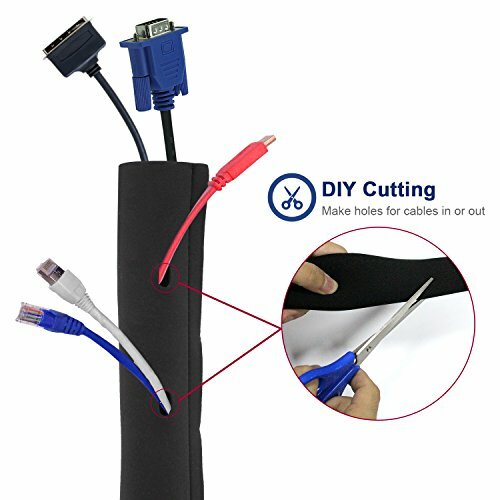 Are you tired of the eyesore of your disorganised cables? It may seem an overwhelming task to tackle the cable monster but there are various tools that you can use. 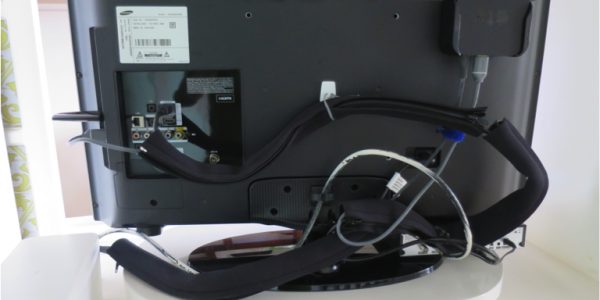 In this article, I’ll walk you through how I cleaned up my TV’s cable mess. This TV is atop a rotating table and is shared between 2 rooms. The cables behind the TV are highly visible. Because of the unique position of this TV, it is not wall mounted and the TV’s back is visible in one of the rooms when it is rotated. 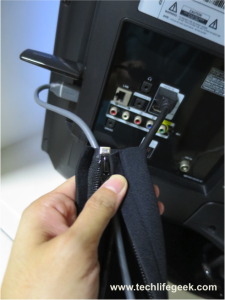 The cables need to be flexible to make sure the TV can rotate freely. It’s a very challenging task to hide this mess. The typical solution for hiding cable wires from the TV is to mount the TV and put a tube inside the wall where the wires can pass through. Another solution is to mount everything under a table, including the wires. However, because of the unique placement of this TV, these options are not possible. The TV can not be wall-mounted. It sits on a lazy susan-like table on a window between 2 rooms. The TV rotates and can be used on either room. As you can see from the photo, I have already mounted the Apple TV behind the TV. Now that’s one less clutter. You can buy different types of mounts depending on your needs. 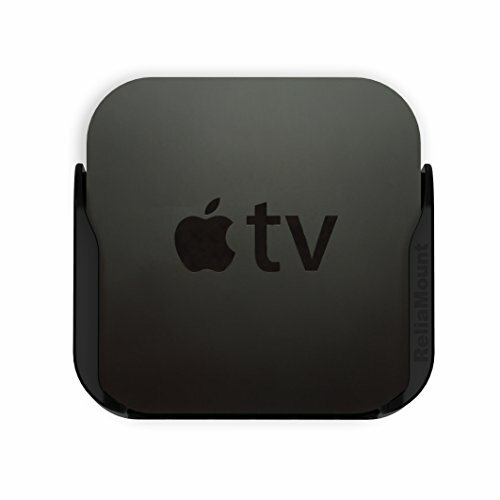 What I’ve used is the ReliaMount Apple TV Mount. Using the Reliamount is very easy. Just wipe the surface first with alcohol before installing with the included adhesive. Make sure that it is within six inches of the edge of the TV to avoid issues with the remote reception. I’ve decided to retain the cable box on its current location as I use its display as a digital clock. But there are mounts available for digital cable boxes. Remember – out of sight, out of mind. Transform your room by getting the cables out of sight. It is liberating and motivating to have a clutter-free space. In this TV project, I’ve hidden 2 things – the cables and the power strip. It’s easy to hide the power strip or extension cord. I’ve used a power cable storage box as seen below. Choose a size for your power strip and just place it inside. I’ve recently discovered the cable management sleeve and it made a big difference! In using the sleeve, I have found that grouping together cables coming from the same source helped. Use one sleeve for each group. Make sure to start putting the sleeve nearest the source as shown in the photo below. 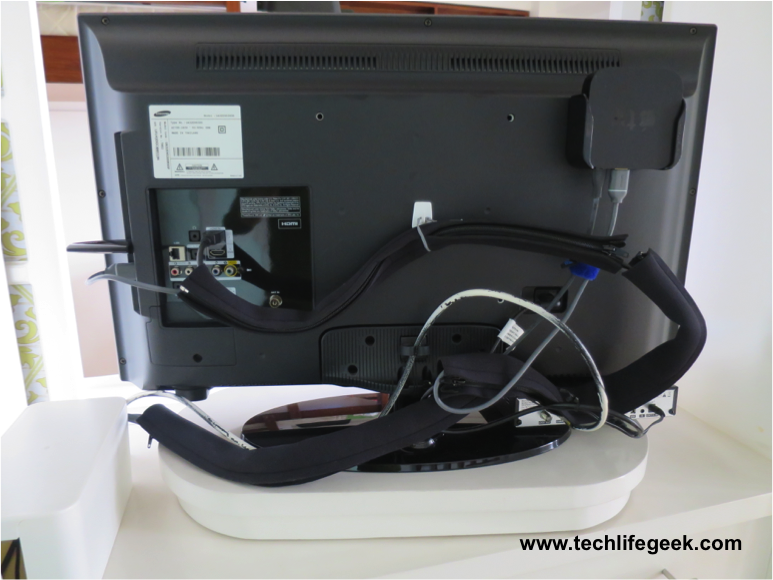 For any remaining loose cables, use cable ties to neatly bundle them together. Hooks can be used to hang loose cables. Here’s the final outcome. No more eyesore! This motivated me to start working on my desktop setup at my home office. Do you have tips on how to organise and hide cables? Share your experience and questions in the comments below. You said that people put a tube inside their wall where the wires can go. If I had a mounted TV I might think about getting that done. There might be better ways that would make it easier to move also. I like the idea of just hiding the various cables in plastic boxes or behind the wall. It makes sense that fewer cables would look better than a lot of cables showing. I’ll have to keep this in mind because having dedicated data cabling in each room would be a good way to avoid extension cords and other wires from being shown. Totally agree that fewer cables would look better than a lot of cables showing. 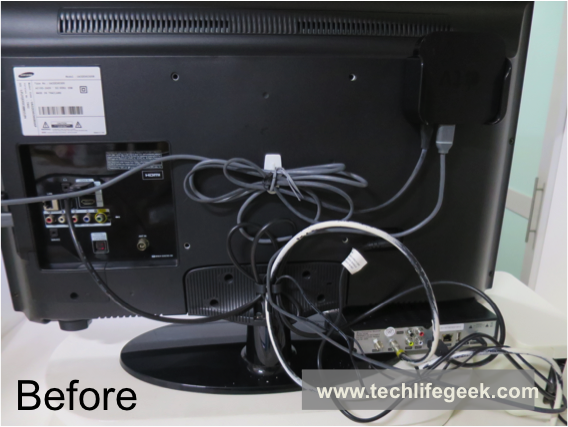 If for some reason, you can not hide the cables, tie the cables together tightly – it would make a big difference!